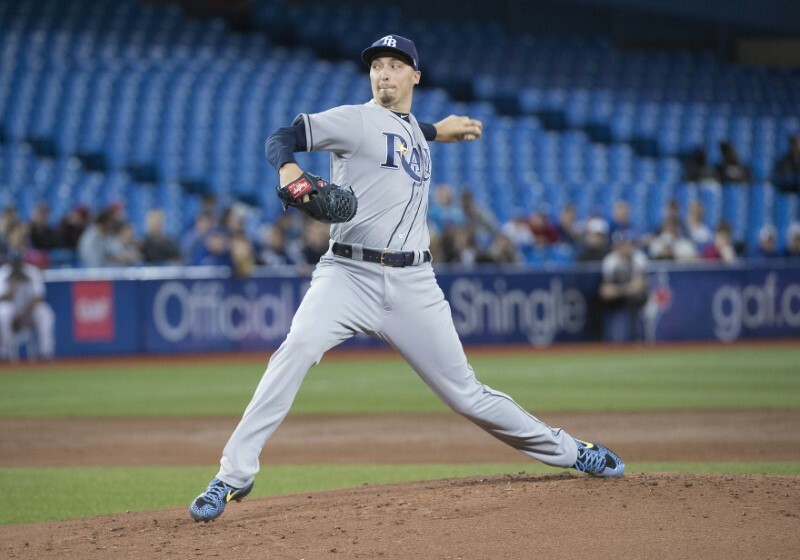 The Tampa Bay Rays placed ace left-hander Blake Snell on the 10-day disabled list Tuesday due to a broken right toe. Snell said he broke his toe when a decorative granite stand in his bathroom fell on his right foot as he was getting out of the shower Sunday night, the Tampa Bay Times reported. His IL placement is retroactive to Sunday. On the season, the reigning American League Cy Young winner is 2-1 in four starts with a 2.16 ERA. In 25 innings, he has struck out 36 batters, tied for the major league lead entering Tuesday’s games. Snell, 26, was 21-5 last season with a 1.89 ERA. –The St. Louis Cardinals placed outfielder Tyler O’Neill and right-handed reliever Mike Mayers on the injured list one day after both players were injured during a loss to the Milwaukee Brewers. O’Neill sustained an ulnar nerve subluxation to his right elbow after making a throw home from center field in the bottom of the second inning Monday. He was pulled for a pinch hitter in the top of the third inning. Mayers sustained a lat strain in his pitching shoulder. He felt cramping just before Milwaukee’s Christian Yelich blasted a three-run homer off of him in the sixth inning. –Major League Baseball is investigating racist social media posts aimed at Chicago Cubs relief pitcher Carl Edwards, a league spokesman told The Athletic. Edwards received racist messages on Instagram, according to the report, drawing the attention of the league as well as the players’ union. The Cubs demoted Edwards to Triple-A Iowa earlier this month to iron out his woes to start the season. Edwards had a 32.40 ERA in four relief appearances this season, allowing six earned runs in just 1 2/3 innings. –The Boston Red Sox designated former first-round pick Blake Swihart for assignment and recalled catcher Sandy Leon and right-hander Erasmo Ramirez from Triple-A Pawtucket. Swihart, primarily a catcher, was batting .231 with one homer and four RBIs in 12 games this season. The 27-year-old also saw playing time at first base and left field. He batted .256 with nine homers and 58 RBIs in 202 games over parts of five seasons for Boston. Leon, 30, has a .226 average with 20 homers and 104 RBIs over parts of seven major league seasons. He spent three seasons with the Washington Nationals (2012-14) before playing the last four for Boston. –First baseman Greg Bird joined an overflowing injured list for the New York Yankees. Bird is out with a torn plantar fascia in his left foot and was placed on the 10-day IL retroactive to April 14. The Yankees have 12 players on the injured list, including catcher Gary Sanchez (calf), third baseman Miguel Andujar (shoulder), shortstop Troy Tulowitzki (calf), second baseman Didi Gregorius (elbow) and Bird. Replacing Bird on the roster is first baseman Mike Ford, who was recalled from Triple-A Scranton/Wilkes-Barre and joined the Yankees as they opened a series with Boston. –Major League Baseball is gearing up to celebrate the 250th anniversary of the Declaration of Independence with the announcement that the 2026 All-Star Game will be played in Philadelphia. Commissioner Rob Manfred delivered the news in front of Independence Hall, sharing the stage with All-Stars past and present including Phillies Hall of Famer Mike Schmidt and new Philadelphia outfielder Bryce Harper. This will be the fifth Midsummer Classic in Philadelphia, which was hosted at Shibe Park in 1943 and 1952 and at Veterans Stadium in 1976 and 1996, but will mark the first All-Star Game at Citizens Bank Park, which opened in 2004. Cleveland will host this year’s 90th All-Star Game on July 9, and Los Angeles will host the 2020 game at Dodger Stadium. Sites for 2021-25 have not been named.